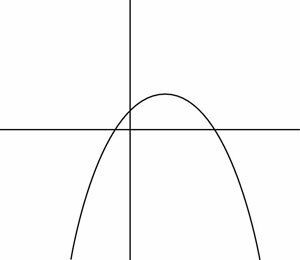 To save time when graphing a quadratic function on the ACT Math test, you can quickly find the location of the y-intersept of the parabola based on the sign of the variable c.
The variable c is the constant term of the quadratic equation, y = ax2 + bx + c.
When c is positive, the y-intercept is positive. 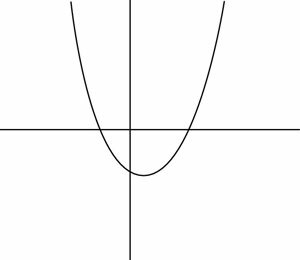 In other words, the parabola intersects the y-axis above the origin. When c is negative, the y-intercept is negative. 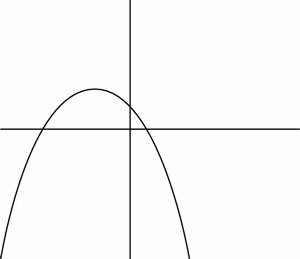 That is, the parabola intersects the y-axis below the origin. 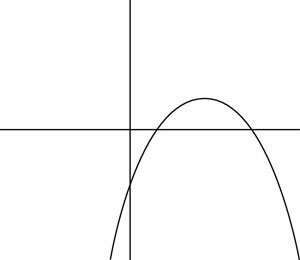 Which of the following could be a graph of the function y = –x2 + 5x – 2? In this equation, c = –2, so the y-intercept is below the y-axis. As a result, you can rule out Choices (C), (D), and (E). 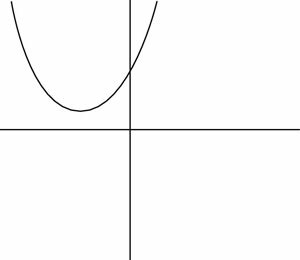 Additionally, a = –1, so the parabola is concave down. So you also can rule out Choice (A), which makes the correct answer Choice (B).